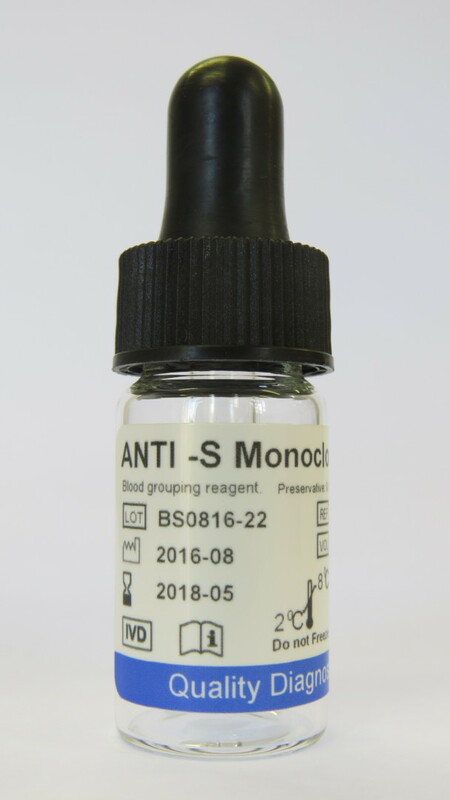 Anti S Monoclonal Reagent for the Indirect Antiglobulin Technique (IAT), DiaMed-id and Ortho BioVue techniques. These reagents are suitable for the use with the Indirect Antiglobulin Technique (IAT), DiaMed-id and Ortho BioVue techniques. These Monoclonal IgG blood grouping reagents contain human monoclonal antibodies diluted in a phosphate buffer containing sodium chloride and bovine albumin. Each reagent is supplied at optimal dilution for use with all the recommended techniques stated below without the need for further dilution or addition.